Cleveland, OH (February 19, 2010) – According to figures released today by the Greater Cleveland Automobile Dealers’ Association (GCADA), January 10 v. January 09 new vehicle car and truck sales increased less than 1%. Ford led all automakers followed by Chevrolet and Toyota for January Northeast Ohio sales. “The January sales reflect a slow recovery, however numerous brands have posted strong increases in January 10 v. 09. Interestingly, luxury sales are beginning to grow which is traditionally a leading indicator of consumer confidence in the marketplace.” says Louis A. Vitantonio, Jr., President of the GCADA. 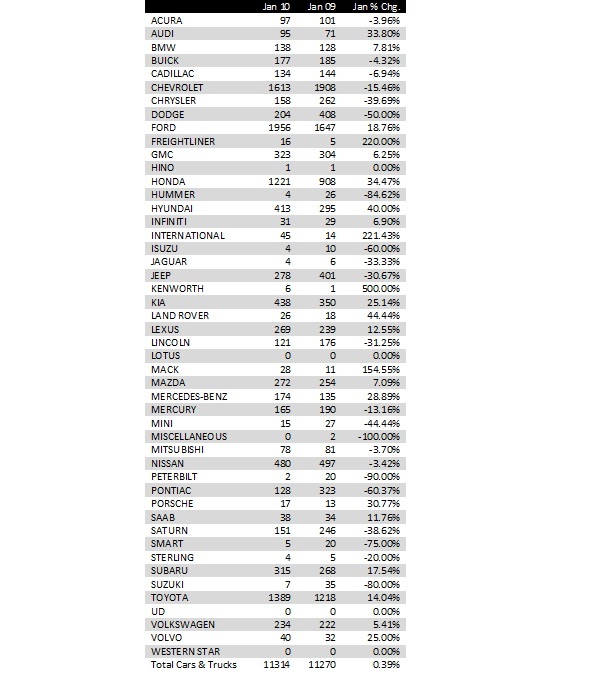 The following eighteen brands posted sales increases in January ‘10 versus January ‘09: Audi, BMW, Ford, GMC, Honda, Hyundai, Infiniti, Kia, Land Rover, Lexus, Mazda, Mercedes-Benz, Porsche, Saab, Subaru, Toyota, Volkswagen and Volvo.